We’re near the end of this Make Cycle on gaming for the Making Learning Connected MOOC. 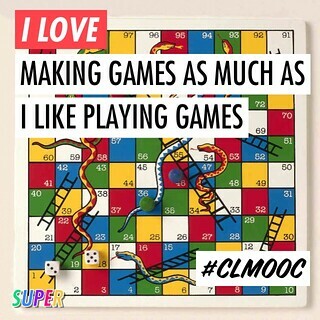 There have been some interesting games made and played in the CLMOOC community, as well as some confusion about where to even begin and how gaming might have implications for the classroom. I’ve long tried to make the pitch to other teachers that engaging students in game design is both a valuable learning experience and a motivating activity. In the first year that my co-teachers and I implemented a game design unit between science and ELA, we set up a website to capture our own learning process and to share resources. And you don’t need computers, either, to engage in the merits of gaming. 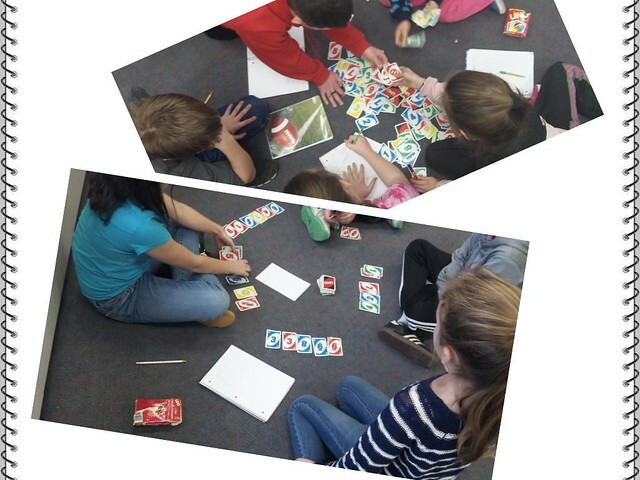 Hack a game or invent a game to be played with cards or on the playground. Or hack the game of chess. Or have students engage in persuasive writing about the merits of gaming, or have them write a review about a game they play. 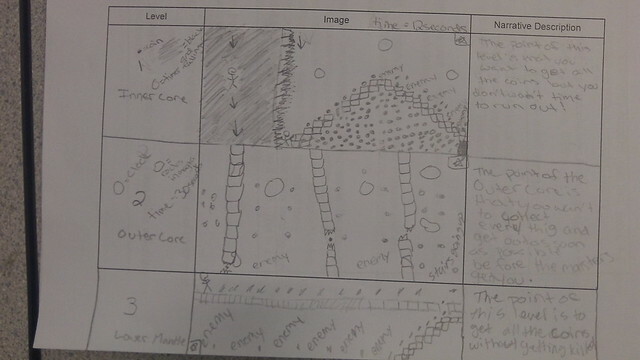 Use storyboarding a game as an analogy for drafting a piece of writing. 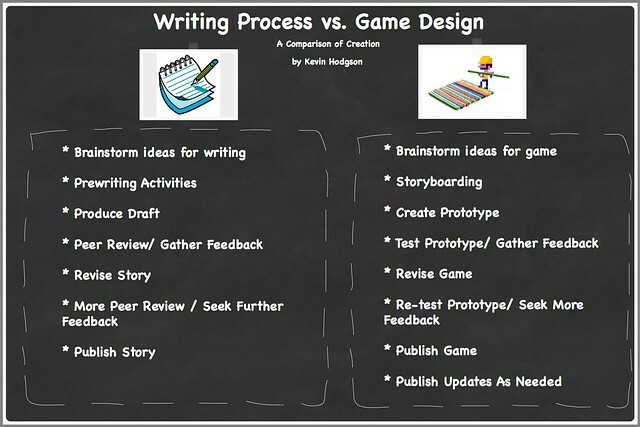 Consider game design as a means to teach students about peer review and iterative process. 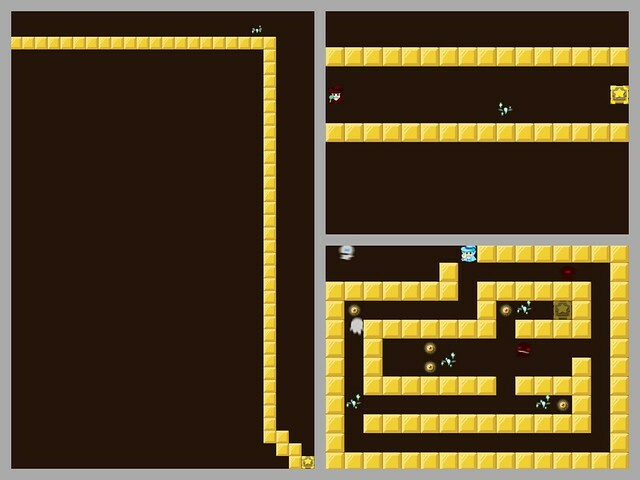 Connect game design to other curricular areas and then use a site like Gamestar Mechanic to build and publish authentic video games. Yes, it might be a little uncomfortable for a teacher who is not a “gamer.” I am not a gamer. But I am intrigued by games, and when we do our science-based game design project each year, the hum of learning and activity and engagement is something to behold. We’ve been toying with games at the Making Learning Connected MOOC all week but I was curious about how to map out some of the game ideas from everyone onto the principles of Connected Learning, which is the underpinning of the CLMOOC. This Thinglink project is my attempt at doing that. Hover over the principles to find some links to games that meet the various elements of Connected Learning. 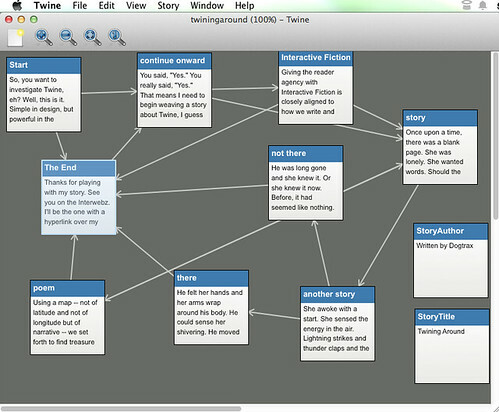 Over at CLMOOC, some folks are playing with Twine this week for Interactive Fiction as game design. That brought me back onto Twine to play around with it a bit, too. Twine is a bit of a learning curve, but not too difficult. If you know me at all, you may know that my sons are HUGE fans of baseball. In fact, two of them are still playing summer baseball even after the spring baseball season ended. They play, and my wife and I watch, a lot of baseball. And we love it. Recently, another parent of a little leaguer told me about a board game for baseball that is built on a complex system of stats of players. 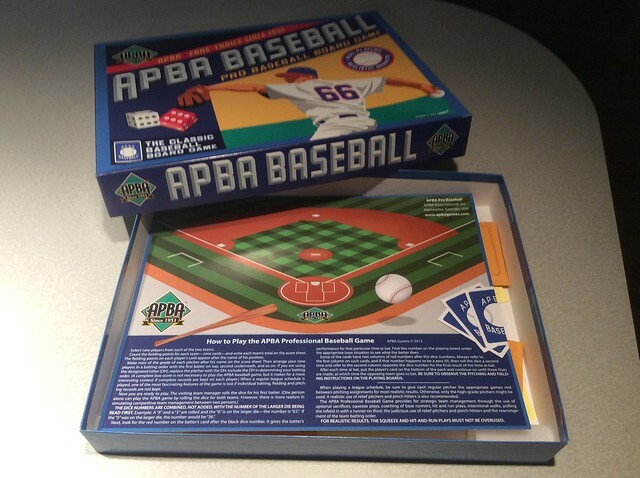 As my sons also collect baseball cards and invent their own games using the stats (still the best kind of game), I decided to get the APBA Baseball set. It was a bit costly (about 4o bucks) but I figured (or hoped) it would be worth it. I bring this up because the Making Learning Connected MOOC is engaged in considering games and systems for this week’s Make Cycle, and while most of us are engaged in the “game” part of things, it is actually the “systems” part of things that is most interesting, particularly from a learning perspective. Systems thinking is concerned with the overall design of an experience (a game, or a business, or a production line, etc.) and how every single part in the system has a role in determining the various possible outcomes. So, if one element of the system gets tweaked or changed, it has a ripple effect down the line (sort of like that famous candy scene in I Love Lucy). In game design, systems thinking is a core philosophy. Either the game designer changes elements as part of the iterative (or revision) process, to improve the game (think of all of those updates you get for your apps on your mobile devices) or they build potential changes into the gameplay itself, allowing the player to make choices and thus, affect the outcome of the game. If you think of that idea for a second, you quickly realize how complex the job of a game designer is. The systems within which we operate can be difficult to understand – and even more so, difficult to discuss. Games – in all their forms – are engaging tools for experimentation. As dynamic and interactive works of art, games can inspire us to tackle and engage with complexity. Plus, games, and the ways in which they are designed, enable us to experiment and have fun with failure: the ability to try, fail, and try again is a powerful tool. When my sons and I first opened up the APBA Baseball game, we were dumbfounded by how complex the game was. Page after page of how each “at bat” is impacted by stats, the roll of dice, the strength of the opposing pitcher …. all meant fairly replicate the actual play of a baseball game. After taking a breath, we dove into the rules, taking it step by step and then we did what you need to do when faced with a complex gaming system: we played the game, and learned as we went along. We made adjustments to our play. There are still some elements we know we need to learn about: base running options, injuries to players, when best to pull and replace pitchers, etc. The system is complex and that complexity keeps drawing us in. If the system were simple, we’d be bored and I would be mad at spending $40 on the game. But we are still figuring out this system of board game baseball, and we’re almost ready for another world series of play. 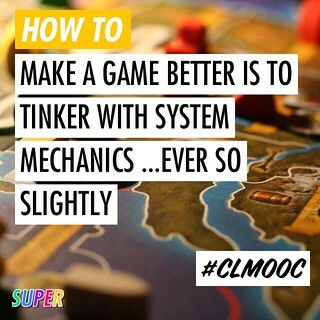 What if #CLMOOC Became One Massive Open Online Game? The Making Learning Connected MOOC is entering into a Make Cycle near and dear to my heart: game design and systems thinking. I am hoping people make some cool games, share some strategies for the classroom and just have fun. I’ve decided to hack a game that I first created for the K12Online Conference, where I presented a keynote about game design in the classroom and then encouraged folks to play a game within the K12online community, for the CLMOOC. (And that game was variation of another that I tried get up and running for last year’s CLMOOC and failed … so this game iteration is just what I needed to redeem that idea and bring it back home to the CLMOOC). The whole idea of this online game is to get folks to interact and connect with other folks and other work in the CLMOOC community. If that happens, everyone truly is a winner. Each element or round is about deepening connections and recognizing and honoring work being done either by themselves or by others. It’s a way of encouraging folks to move beyond their safe zones, in a fun way. Instead of points, we will be using mookles. 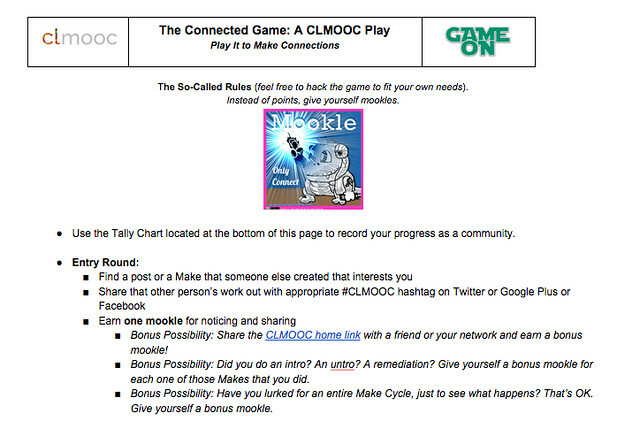 You’ll have to come to the launch page of The Connected Game: A CLMOOC Play to see what a mookle is (it sure is cute), and how you can get involved on the tally board (add your name and you are in the game). There are suggested “rules” that can be broken and hacked and ignored at any time, as long as the connected element is part of the playfulness. Come play the game. Get connected. This was a fine way to end the school year – writing stories and connecting back to a running theme of the year of game design. For the last two weeks of school, students worked on writing a short story in which someone from history was stuck inside a game and the protagonist must go into the game and get them out within 48 hours. Think Jumanji as a mentor text. 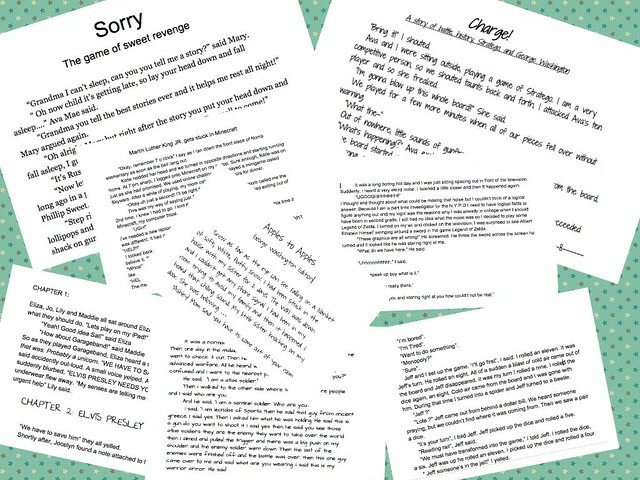 My students were really invested in this story writing, working hard for days, right up until the very last day they could write, and because they were using their Google Docs accounts, it will continue for many of them right into the summer. The whole concept here was to use game dynamics as a setting element and plot device for story writing, and since we have been talking, hacking, creating games all year, it tied together some threads for the year. Yesterday, I shared out a game that I made in Gamestar Mechanic for some friends who are part of a book study group toggling between online and offline meeting. I am online only. In the book, Teaching Naked, the author (Jose Bowen) goes into detail about how gamification might change the way students in a college classroom interacts with material and enhance learning. Note: I am not convinced on all of the merits of gamifying our classroom but I am intrigued by game design as a learning possibility, and teach an entire unit to my sixth graders on game design. I even did a K12 Online Conference keynote about it. Some of us in the book group called #Tomereaders were talking about games and wondering how we might create a game for the book study group. That might still happen. I saw some sketches of game levels from Matthew Cook. He was making a point about engagement and design, I think, but I decided to take his levels literally and design a video game with his sketches as my template. I decided to keep things simple, with limited enemies and treasure, and more of a discovery game of content related to the book we are reading. You can play the game, too. I had an interesting conversation with a doctoral student who is doing her work on how teachers are evaluating and assessing student digital writing projects. I am part of her study (well, as a teacher, I am participating) and yesterday, we had a 90 minute chat about assessing digital work. Interestingly, this connected in my head to the inquiry going on at Rhizomatic Learning this week, too. During our time, she asked me a lot of questions and I admit, I struggled to explain how I best assess digital writing projects that my sixth graders make. Even after co-editing a book on assessment of digital writing (Teaching The New Writing), and even after years of bringing various projects into my classroom to push at the notions of what it means to write in a digital age …. I am often as lost as I have ever been. In particular, yesterday, I did a very close look at a video game design project and “talked through” what I was seeing, using my own project indicator sheet as my guide. It had been some time since I had played this game called Into An Animal Cell (you can play it, too) , and I remained impressed by the work of this student. Talking the game through with my assessment lens on as I played it was another way to examine the moves of the student around game design, story narrative and the use of science as the underpinning theme. But I openly admitted to her: grading/assessing something that has many modalities — here, for example, game design, science concept, story narrative, science vocabulary, etc. — is something I continue to grapple with on so many levels. If I get too specific, then I lose the flavor of the whole. Too general, as I am in the assessment tool for this project, and it is nearly meaningless. And then there is the element of “newness” here — I’m lucky if one of two of my 80-odd students ever designed and published a video game. Assessing the newness of the skill tugs in contrast to the learning experience I want them to have in the end, which is a design mentality and expanded notion of story narrative flow in a multimodal space. I still seek (and yet, have not yet found) the balance here to create an assessment that will do what an assessment tool is designed to do: guide the student to make improvements so that they can further their work and learn from the experience. 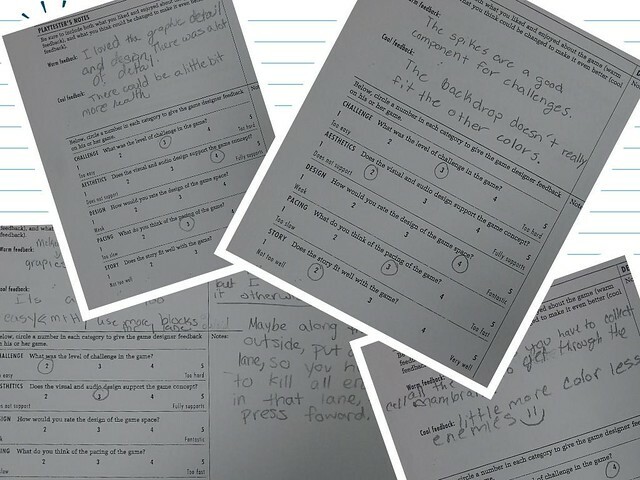 I still feel as if I am designing assessment tools to give them a grade. The tool is for me more than for them, as a way for me to justify why we are making video games. I need to turn that whole perspective on its head. I need to better figure out how to create something more meaningful for my students. I’m still struggling with this. As it turns out, so are many others, as evidenced by some of this researcher’s other interviewees. 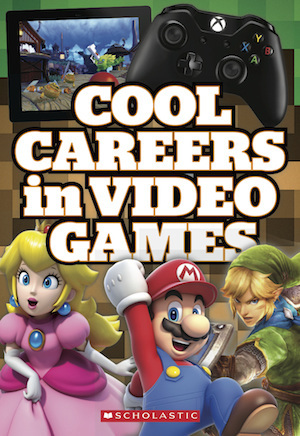 I saw this book — Cool Careers in Video Games — in our latest Scholastic Book order catalogue and used some of my “classroom points” to pick it up. I wasn’t sure what to expect, but given my students’ high interest in gaming, it makes sense to have it as a resource. I’m glad I grabbed it. The book is full of short non-fiction profiles of people in the video gaming industry, from writers to programmers to animators and more, with a nice balance of men and women. The questions often have a focus on advice for students who are interested in gaming, and while most riffed on the theme of “follow your passion and dream,” there were a few who noted how math skills and writing/communication skills are critical. What I most liked about the book (its former title apparently was Hot Jobs in Video Games) was the introduction overview of the world of the gaming industry, as it provides a handy progression of how a game goes from an idea to being published, and all the work that goes on in-between. And I like the glossary at the end, where there is a multi-page list of all of the different kinds of jobs and skills one would need to become part of that emerging job market. As far as I can tell, you can only get Cool Careers in Video Games through Scholastic books.